US President Donald Trump has hit back at Canada for criticizing its newly-imposed tariffs and said Canada charges the US up to 300 percent on dairy. "Prime Minister Trudeau is being so indignant, bringing up the relationship that the U.S. and Canada had over the many years and all sorts of other things...but he doesn't bring up the fact that they charge us up to 300 percent on dairy - hurting our Farmers, killing our Agriculture!," Trump tweeted. On May 31, the US announced to impose 25 and 10 percent tariffs on steel and aluminum respectively on three of its biggest trading partners - Canada, Mexico and the European Union (EU). 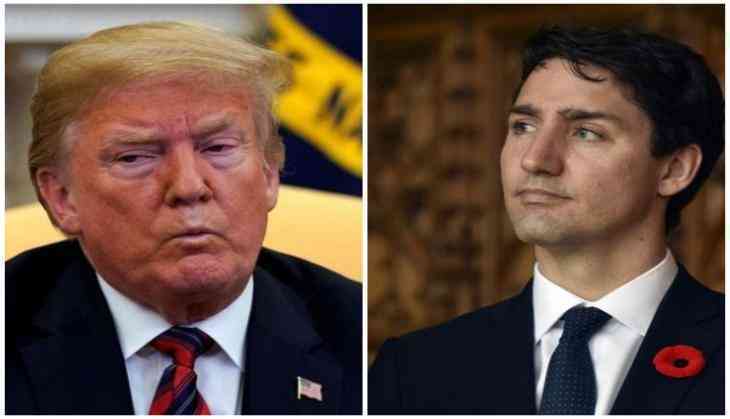 Earlier on June 2, the Canadian Prime Minister Justin Trudeau dubbed the trade tariffs 'insulting and unacceptable' and announced that the country would impose its own tariffs on US' goods in retaliation.